So as I was finishing my Pinterest inspired project I had a mini disaster. The lamination sheet got caught on the inside edge and wouldn't come out. I got it cleared away and finished my laminating but it reminded me of a funny story. Two years ago at school I was laminating on the big machine. As I leaned forward to see if the project had cleared the machine my name tag got caught in the machine and started to feed into the rollers. Scary thing was the nametag was on a lanyard around my neck, Yikes! One of my student's mom was just coming down the hall and she helped free me and get the tag out of the laminator. Other disasters for me? Yup, one time I cut part of a scarf in the paper cutter. Have you ever had a disaster with the school office equipment? Do you follow Jeannie from Kindergarten Lifestyles?If you don't you should click right over and read her blog. She is awesome!! She is also having an awesome giveaway!! 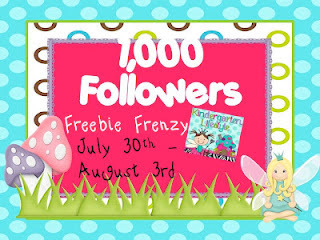 She has a bunch of freebies on her blog, but only until August 3rd. I can't wait to see all the giveaways! This is the file from my store that will be free until Friday. You can grab a copy by clicking on the link below. Yikes! The first experience you had was kind of dangerous though. Anyway, I did have. I printed a big picture of me, which is not allowed, and yea, my employer caught me.